CHASM uses its patented CoMoCAT™ process for CNT synthesis. Proprietary catalyst powders are combined with carbon-containing feed gases in custom fluidized bed reactor designed to produce a portfolio of high-quality CNT products via catalytic chemical vapor deposition (CCVD), which is widely recognized as the most scalable method for making CNTs. 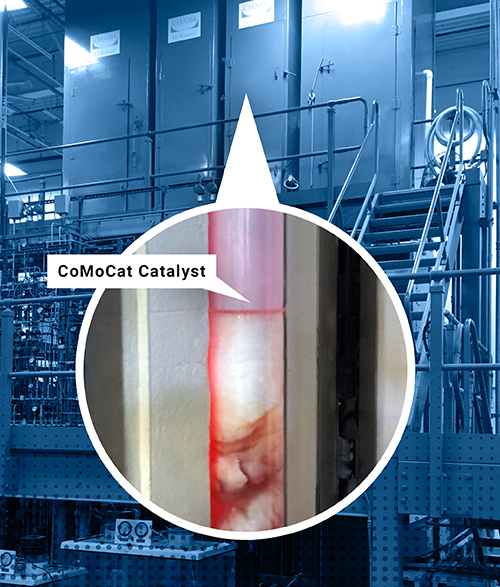 The CoMoCAT™ process enables catalyst sites to be formed in situ with atomic-scale precision, which enables superior purity and control of structure. These combined capabilities enable CHASM to tailor CNT products for its target applications, resulting in superior product solutions for customers in the areas of quality, cost, scalability and ease of use. It is significant to note that one of CHASM’s single-wall CNT grades has been selected as the Standard Reference Material for CNTs by the National Institute of Standards and Technology.